We’ve all had those nights: You come home from work, order something on Seamless, and — whoops! — eat half of a box of cereal while you wait for your food. After all, you’re hungry and need something to mindlessly graze on while you come down from the day. It’s okay. We have a solution. This super-simple dinner only calls for five ingredients, and it’s ready in five minutes, tops. Think you can do it? Feel free to use vegetable broth and vegetable or tofu dumplings to make this meal 100% vegetarian. Add a little more bok choy if you want to feel super healthy, or nix it completely if you’re too lazy to chop — no judgment here! 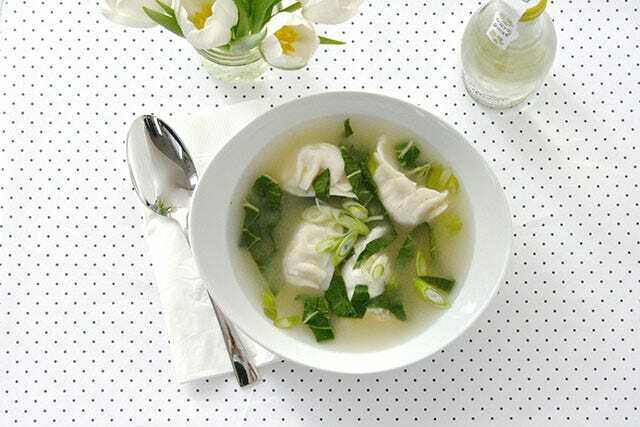 Put the chicken broth, bok choy, dumplings, and vinegar in a microwave-safe bowl, and microwave on high for three minutes or until dumplings are heated through. Top with the scallions.